Who Investigates Nursing Home Abuse? - Law Offices of David M. Benenfeld P.A. When a loved one is injured because of nursing home abuse or neglect, you might wonder what happens once you report it. More so, who do you report the abuse to so that you can ensure it does not happen again? It is vital that you know what to do immediately after you suspect something is wrong with your loved one’s nursing home. Never wait to report the abuse, and be sure to follow up to ensure that something is being done about it. After all, you are your loved one’s primary advocate. You could be the difference between abuse going undetected for months, or something being done to stop it. Who Do You Report Nursing Home Abuse to in Sunrise, Florida? If you suspect nursing home abuse, you have a few options for reporting that abuse. These are the parties who will investigate nursing home abuse or neglect allegations. You can approach management or the owner of the nursing home and voice your concerns. You should do this first to initiate the complaint process. The nursing home is required by law to respond to all complaints with an official investigation. So if they don’t do anything about the abuse you can report this inaction – and they may lose Medicare and Medicaid funding as punishment. If you feel that your case is not being looked at after talking to the nursing home administrator, then move toward the next step. All states have an Ombudsman, who is an advocate for nursing home resident rights. You can report the suspected abuse or neglect, and explain how the nursing home has handled your complaints. You will want to contact the office in the county where the nursing home is located. Ombudsmen keep records of all complaints and conduct investigations. They can also advise you on a new nursing home to transfer your loved one to in the event you feel that abuse or neglect is happening and want them removed. In Florida, you can contact the state Ombudsman in the Department of Elder Affairs. Also, you have county-based Ombudsman services to complain to throughout the state, including the Broward District, the Panhandle District, and the Florida Keys. Call them directly. This will get the process started quickly and is essential if your loved one has already suffered an injury. You can complete the BHS Health Facility Online Complaint Form. You may not receive a response as quickly online, but you can voice concerns with this service. Mail and fax your completed form to the local nursing home complaint center. This is the slowest method and not recommended for urgent investigations. An experienced nursing home abuse attorney can not only help report the incident to the proper authorities, but can also hold nursing homes accountable for the abuse and neglect that your loved one experiences. Can I Contact the Police? If your loved one is seriously injured from outright abuse, or you suspect that the nursing home intentionally caused a loved one’s death, you should contact the police right away. Sadly, cases of serious abuse and neglect are often not reported to law enforcement. Law enforcement will conduct their own investigation into the abuse allegations, and in some cases, caretakers or the nursing home administrator may face criminal charges. Any time a nursing home resident is neglected or abused enough to send them to the emergency room, it should be reported to the police. What Are the Signs and Symptoms of Nursing Home Abuse and Neglect? 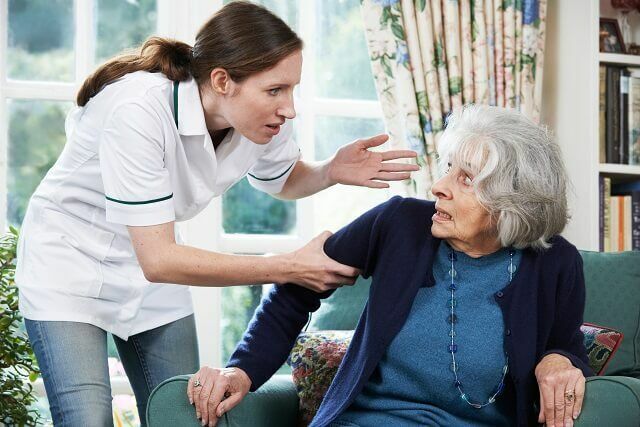 Nursing home abuse and neglect are two different things, which means you need to know what to look for so that you can indicate whether you suspect abuse or neglect. Abuse is intentional, while neglect could be due to understaffing, lack of funding, and lack of responsibility by caretakers. An attorney cannot arrest caretakers or fine nursing homes for your loved one’s injuries, but they can help you in other ways. An experienced nursing home attorney is especially helpful when the nursing home is denying any wrongdoing. Every injury case is unique, and you need someone who can gather the evidence, build a case, and hold nursing homes financially responsible for what happens to your loved one. If you suspect that your loved one is being abused or neglected, do not wait. Contact law enforcement, follow the proper reporting procedures, then contact an advocate from The Law Office of Law Offices of David M. Benenfeld P.A immediately. We have years of experience handling cases just like yours, and we are here to make sure nursing home abuse and neglect does not go unnoticed. Schedule a free case evaluation today at 954-677-0155 or request more information about our legal services online.